Reel Talk Online: It's Good to Be Bad: Carol on "The Walking Dead" and Tara on "Sons of Anarchy"
It's Good to Be Bad: Carol on "The Walking Dead" and Tara on "Sons of Anarchy"
The small screen continues to produce some of the most fascinating female characters we've seen this year. While not all of them may not be--how do you say--lovable, they never fail to bring the drama. They are captivating to watch, even if you love to hate them. Even better, they give the actresses who play them a chance to dazzle audiences with their impressive range. Their spectrum of talent has really been put to work lately as TV delves into the good ole "good girl gone bad" trope. Except, it doesn't seem like a gimmick certain shows are using to draw audiences. In other words, it seems genuine. Two of the series that have done it quite well recently are Sons of Anarchy and The Walking Dead. Both shows in some ways couldn't be any more different; in other ways they are kindred spirits. The former follows a motorcycle gang waist deep in the illegal gun business; the more they try to get out of it, the further they sink into it. The Walking Dead surrounds a group of survivors of an zombie apocalypse struggling to make sense of their slowly expiring lives--which compels them to go to extreme measures. Both shows feature characters in extraordinary circumstances that choose to do something immoral in order to do what they believe is right or what is needed to be done in order to survive. This usually involves lying, cheating, killing and stealing. The realization of the characters and how they got to these circumstances makes it that much more enthralling to watch. After being on the air for several seasons, both series have steadily shaped their prime female characters into becoming one with their environments, for better or worse. For instance, Carol on The Walking Dead (Melissa McBride) went from a lost, abused wife nearly crippled by the death of her young daughter to an independent, free-thinking rebel. But that transformation came with a price. She begins teaching the group's child survivors to defend themselves against undead invaders with deadly weapons. Then, in a move that was controversial among viewers, Carol takes it upon herself to kill the survivors who became afflicted with an inexplicable virus, in hopes to stop it from spreading. It was a decision she made alone, and which caused her exile, and it really made audiences see her in a new light. As Rick (Andrew Lincoln), a fellow survivor who's committed his share of questionable acts, underscored, she was once a scared, docile woman who's now someone else entirely. 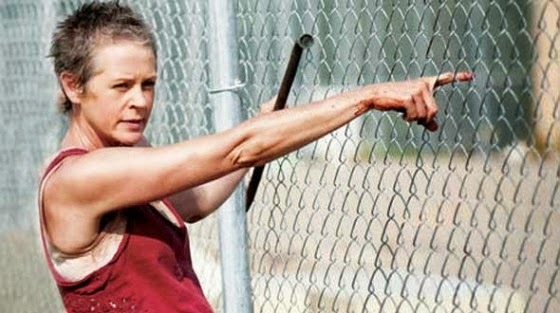 We'll have to watch Sunday's episode to see what will become of Carol now seen as a leper. 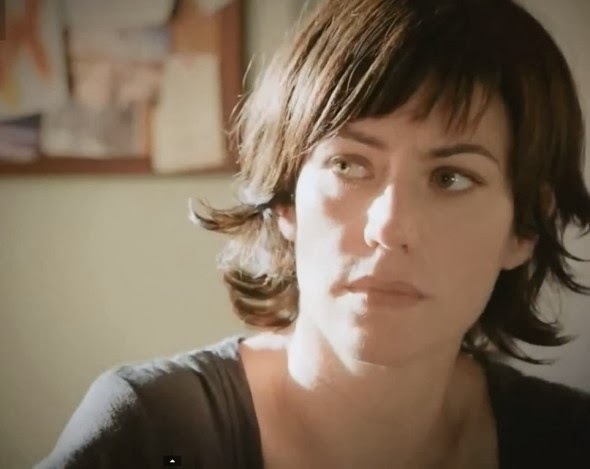 Meanwhile on Sons of Anarchy, it is Tara (Maggie Siff) who has undergone a shift in perspective. The once honorable doctor, who frequently offered pro bono medical services to the titular club, is now joined in unholy matrimony (known as becoming an "Old Lady" in the Sons world) with Jax Teller, leader of their gang. So far in her short-lived marriage she has committed several crimes, including conspiracy to murder, lost her job and has even served jail time all as a result of her affiliation with the Sons. Now, as she struggles to regain some sense of civility in her life, she schemes to secretly divorce Jax, take their two young sons and a large sum of Jax's money, and move out of town. In Tara's search for redemption, she feels she must first commit her final--and perhaps ultimate--act of betrayal. If you watched this week's episode, you know that Jax found out about her plan and, judging by next week's teaser, is now concocting one of his own at Tara's expense. While Tara's new arc has dismayed some fans, I found the writing to be authentic for a character who--albeit willingly--became a victim of her acquired terrain. She's smart, resourceful yet personally conflicted to her own fault. This is a familiar theme on the show, as each of the criminal protagonists have similarly dealt with feelings of being trapped in volatile situations. But still, the audience's reaction to Tara is different from anyone more entrenched with the club. Sons creator Kurt Sutter has so immersed us in the world of antiheroic gangsters that every other character that comes in their path--no matter how innocuous they may be--is automatically deemed a villain. It will be interesting to see where the writers take both of these compelling characters, just as much as as it will be to gauge the viewer reaction. But it is perhaps most important to note how meaty the roles are for actresses on the small screen these days. They're stealing scenes and taking names. Excellent take on these two characters. Both are fascinating portrayals of people in extreme situation like you said the results have come off as authentic. Carol is an interesting case, I'm curious to see how long she's gone from the main cast and how she comes back. Great take on this! I'm really nervous about what they are going to do with Carol's character. I hope they bring her back, and let her redeem herself and save the group, but if she dies during this season, I will be so pissed. Killing her would be throwing the strongest female character on that show away, and it would make me sad.